In order to complete the projects detailed in this course, you will need Microsoft Excel loaded on you computer. Any version of Excel will work. Videos have been recorded using Excel 2013, but Excel 2007, 2010 , 2013 or 2016 will work in order to follow along. Join me in this course and take control of Microsoft Excel and master the process of automating routine tasks through the use of Excel Macros and Excel VBA. During this course you will build a foundation of working with Excel Macros and VBA. This foundation will be built as you engage and participate in project based Excel Macro/VBA exercises, detailed throughout the lectures within this course. Each of the projects will build upon one another, introducing a new concept each time, starting with the basic building blocks of automating any task within Excel and ending with a fully customized Excel VBA project that will automate a series of Excel tasks. 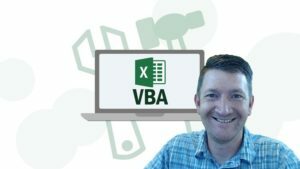 This Excel Macro/VBA course is meant for those that use Microsoft Excel and are looking to become more efficient by automating their daily Excel tasks. No prior programming experience is required.